Highway 101 to Casitas Pass off-ramp. 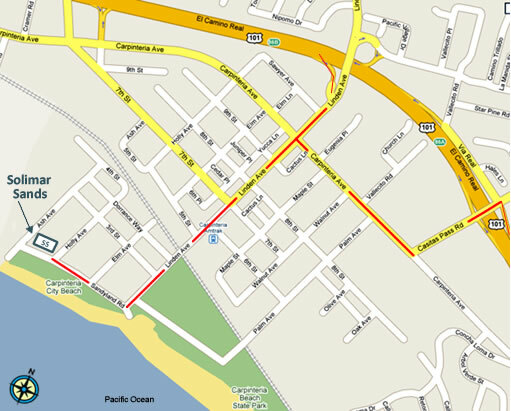 Turn left on Casitas Pass Road (toward ocean) to Carpinteria Avenue. Turn right on Carpinteria Avenue to Linden Avenue. Turn left on Linden Avenue (toward ocean) to the end of Linden Avenue. Turn right on Sandyland Road. Solimar Sands is on the right hand side of Sandyland Road, between Ash and Holly Streets. Highway 101 to Linden Avenue off-ramp. Turn right onto Linden Avenue (toward ocean) to the end of Linden Avenue.